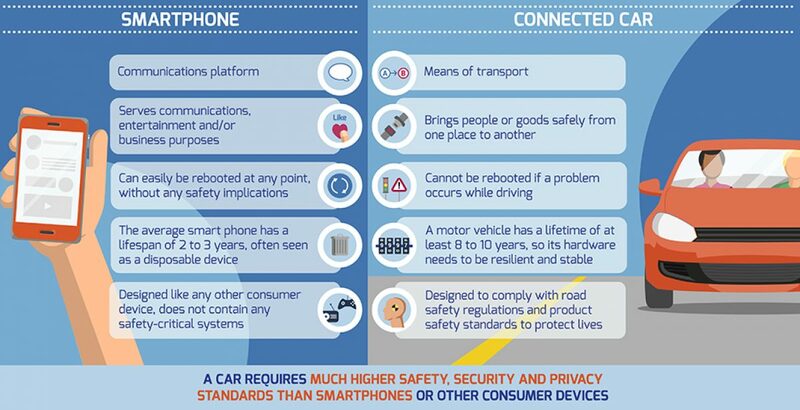 Compared with a smartphone or a PC, a connected vehicle as such requires much higher standards in safety, security and privacy. In addition, vehicles contain ‘highly complex, technically-sensitive systems that must meet high technical and legal standards’. These systems are developed by the manufacturers in compliance with road safety regulations, product safety and quality standards. Vehicle manufacturers are ultimately responsible for the safety and security of the vehicles they put on the market. Today’s vehicles are increasingly ‘connected’ in the sense that they can exchange this information wirelessly with other vehicles, road users, the vehicle manufacturer and third-party service providers. More and more third parties are interested in accessing and using such data to provide services. These include for example garages and breakdown services, insurance companies, operators of parking garages, financial and fleet service providers, and road infrastructure operators. They also include non-traditional automotive players such as entertainment and travel-service providers, social networks, and search engine operators. Data protection is an issue that automakers take very seriously and vehicle owners will have the right to decide with whom they share their personal data and for what purposes.